Here are my blocks for May Mod Mosaic Bee. I must admit that the aqua and red color combo is growing on me. Have a great week! Does the name Ellen Rushman mean anything to you? 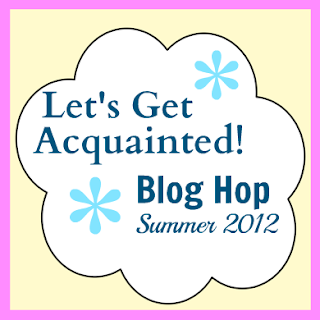 Other than recognizing her name as being a part of QuiltCon, it didn't to me, but that has all changed now! 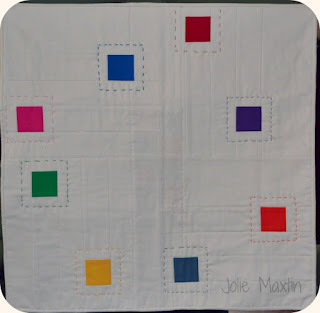 She has embarked on a journey that is near and dear to many of us, the Modern Quilt Guild. In fact, she did an entire thesis on it. Oh yeah! Over 80 pages of an analytical breakout of why we join, why we stay, how we view it, how we view ourselves as members of it and so much more. I like quilts, ok, I love quilts, but I love really digging into why we do the things we do, what draws us to things/groups/products, etc... so this is right up my alley and an added bonus, she is getting her advanced degree from the University of Nebraska-Lincoln, my alma mater - GO HUSKERS! If you would like to read her thesis, you can download it here. Another interest piece is here. 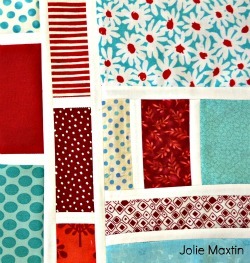 This second one is called TUCKED IN: American Quilts and the Beds They Cover, 1790-1939, written by Madeleine Roberg. But it doesn't stop there, these gals have embarked on a fun and exciting journey over at The Printed Bolt, where they are currently in the middle of hosting a Design Challenge called REPEAT. It's so exciting to see the challenges, as each one is unique. The first phase was, Tiny Dwellings, followed by the Industrial Revolution. The third phase was Geography of your Life and the current, fourth, phase is Up In the Air. I would encourage to go visit each of the challenges, the entries, the judges comments and of course the winners! Please, if you read any part of these, come back and comment - tell me what you think! Bethany is the lucky winner of the batting, thread and Kona Cotton. A big thank you to Sew Mama Sew for coordinating this Giveaway Day. The goodies will ship out on Tuesday. Enjoy! For those of you visiting for the first time from Sew Mama Sew, welcome! Have you heard of giveaway day? This is the first time I have and it is exciting! The good folks at Sew Mama Sew coordinate this, so go check out the many many giveaways that are currently going on. 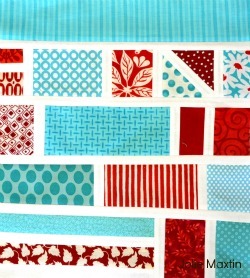 I have selected a theme of white, because any quilter can use this! I am giving away 34" x 45" Warm & White Batting by The Warm Company, along with one spool of Auriful thread, color #2024 and one yard of Kona PFD Bleached White (Color #1287) fabric. If you are interested in this giveaway, please comment below and tell me, of the 3 items, which you are most interested in, and why. You will receive all three if you win though :) The winner will be determined by a random number generator (provided you answered the question) and will only ship to a US address. Comments will be open until Friday, May 25 at 7 p.m. (CST). Winner will be notified by May 27th and your goodies will be in the mail by June 1 (if not earlier). Lots of luck and enjoy Giveaway week! Comments are now closed. Check back for the winner soon. It's that time again! Bloggers Quilt Festival. A giant thank you to Amy Ellis who hosts this event twice a year to showcase our quilts. 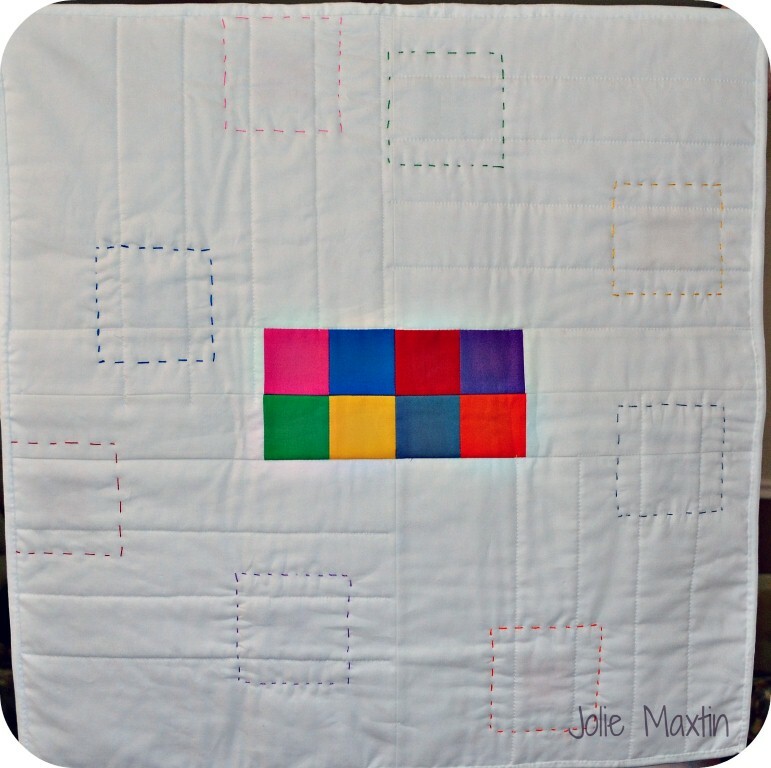 This is a mini quilt that I made in the For the Love of Solids Swap. My partner requested simple, she likes white and wanted pops of color. 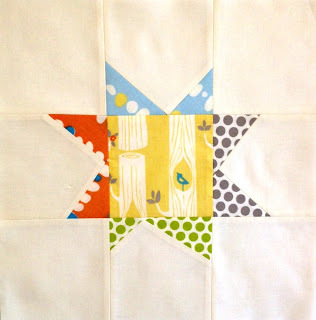 I agonized over this one as it is hard to dig in on a project for someone you don't even know - gah! 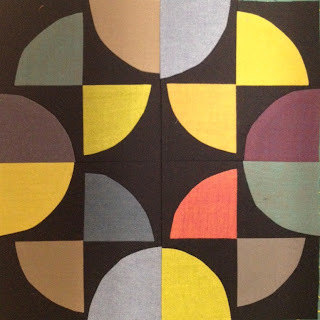 The Tumbling Cubes pattern came from the talented Amy Ellis, from the book Modern Basics (I love that book!) I just scaled it down a little bit. Here is another quilt I did with the full size of this pattern last time around. At the end of the day though, she loved it! I won't tell you which side is the front and the back because either side could be the front or back. Tell me, which side do you like best? The one block of color or the pops of color? I hand quilted this to subtly enhance the design and because I wanted to do something new that challenged me. I really love this quilt because it is simple and modern but not bland. Sometimes there is a fine line. Thanks a bunch for stopping by and enjoy the festival! It's coming this summer and I'm excited to be participating in my first ever blog hop! 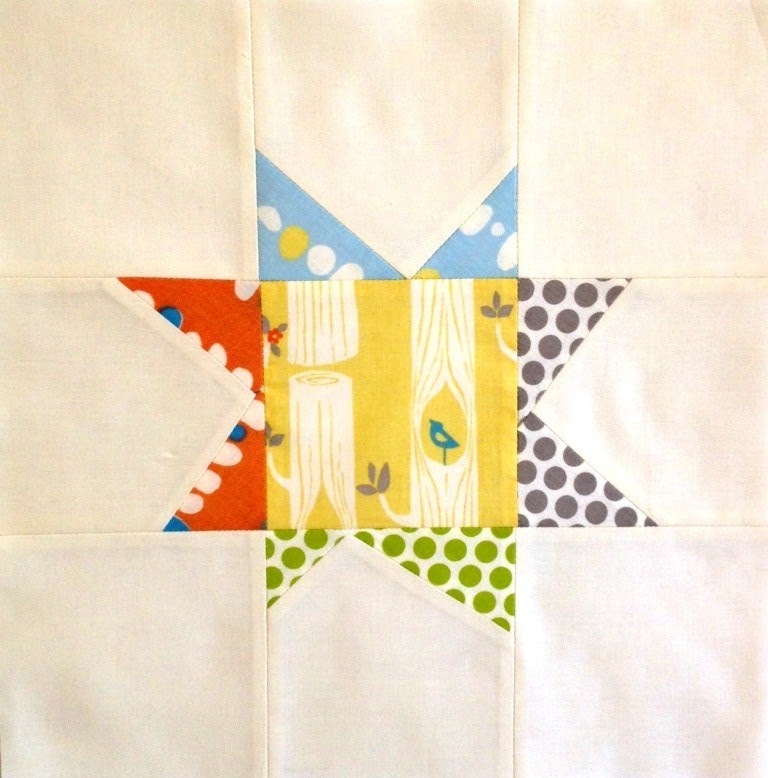 Get ready to be introduced to some wonderful new talent in our blog and quilt world! Do you like to sew curves? I have realized since completing two Drunkard's Path blocks lately, that I, simply, do not. I don't have the curvemaster foot and I don't quite "get" the tweezer method so I just pin pin pin. The result is nice, but I can't imagine a whole quilt of these. Of course, saying this on record means I will probably very soon fall in love with a quilt using this very pattern, but we'll see. 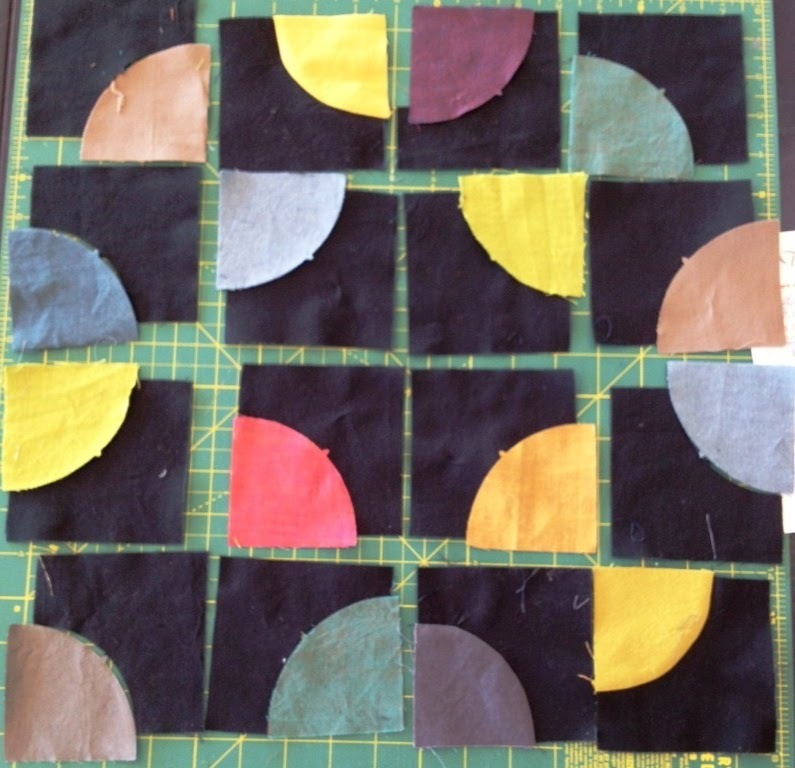 One thing that we did with this, was sew each curve and then trim each square to 3x3 before sewing the big block. I think that made a big difference. Not all of my curves are lined up, but I'm ok with that. It was a learning experience and hopefully once a part of quilt with quilting you will slighty notice, if at all. This is my block for May for my Modern 99 bee. Isn't it lovely? I am so impressed by the fabric selection of my hostess. 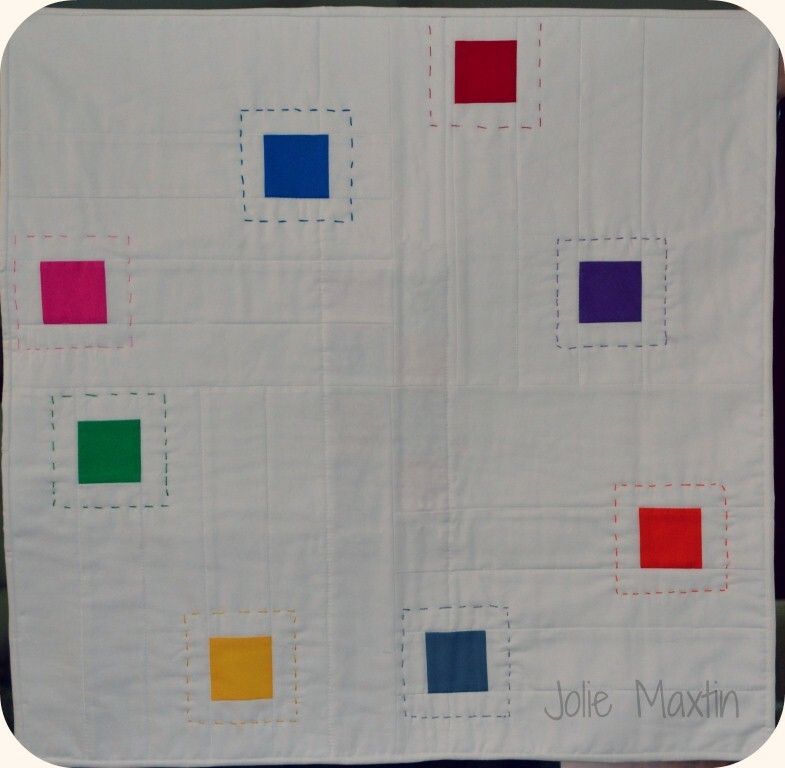 There are just little pops of each color in the center square but she pulls them together in this square so nicely.